Just What Are the Florida Panthers, Exactly? Just What Are the Panthers, Exactly? Not three weeks ago, I was sitting here waxing lyrical about how the Florida Panthers were on a hot streak; about how the bad luck they had been experiencing all season had, at long last, started to even out. The team was extraordinarily fun to watch, and the players seemed to finally be loosening up and having fun. Cue eight losses in nine games (one of those losses came in the shootout, if you want to get technical about it. Then again, so did the lone win.). Let’s not forget the Panthers were Atlantic Division champions just last season (yes, I know, Carey Price was injured. Work with me here.). You probably remember their epic 12-game winning streak that catapulted them to the top of the standings. However, the Cats weren’t just one hot stretch above mediocrity; the team also put together two separate five-game winning streaks, to go with a four-gamer. Contrast with this year: outside of winning eight of nine games from Jan. 26 to Feb. 20. – three and five-game winning streaks sandwiching a regulation loss, the Panthers’ longest winning streak has been two games (something that’s happened five times). For reference, the lowly Arizona Coyotes (24-35-8 and second-last in the National Hockey League) have managed that feat six times. Even the bottom-feeding Colorado Avalanche (19-45-3) have four sets of back-to-back wins. The Panthers have the fifth-fewest regulation wins this season, with 18; only the Avalanche, Coyotes, Detroit Red Wings and New Jersey Devils have fewer. The Cats are a dead-even 11-11 in extra time. In fact, no team has been to extra time more than the Panthers’ 22 appearances. Most teams can throw out a couple of super-skilled players, rendering both three-on-three overtime and the shootout utter crapshoots. Going to overtime in a third of your games is not putting yourself in a position to succeed. 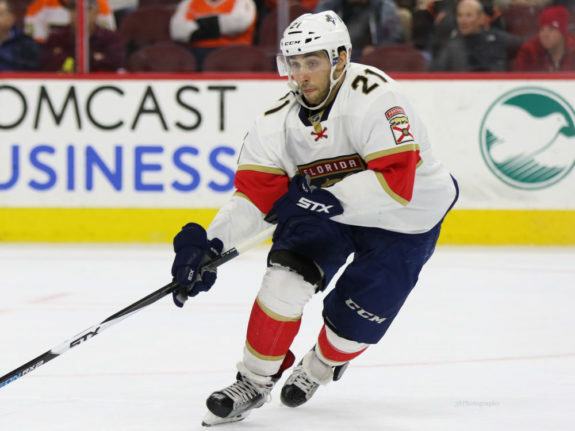 Prior to the return of Aleksander Barkov and Jonathan Huberdeau on Feb 3., the extended absences of their top-line centre and left-winger, respectively, gave the Panthers a viable excuse for mediocrity. After all, outside of the Pittsburgh Penguins, what other team wouldn’t feel the pinch? Florida started 6-1 after the duo’s reinsertion into the lineup, but the team is a rather clench-inducing 1-7-1 since. But What About the Coaching Change? 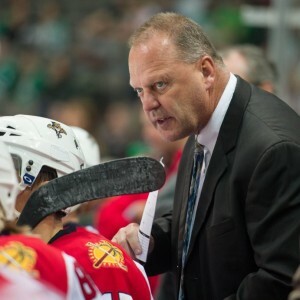 So if it wasn’t the injuries; how about the change in coaching systems following the firing of head coach Gerard Gallant? Well, Florida was 11-10-1 when Gallant was fired on Nov. 27, and are 18-17-10 since. For those of you counting at home, that is a .500 winning percentage beforehand and .400 afterwards. Yikes. That said, both coaches have achieved nearly identical points percentage measures, with Rowe at .511 and Gallant registering .523 (though Gallant had a .583 over the entirety of his Panthers tenure). 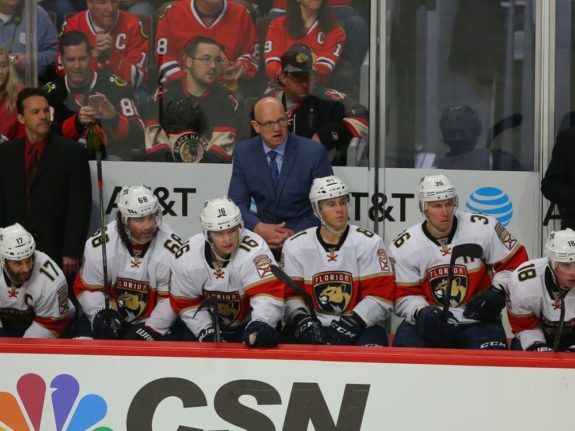 A midseason coaching replacement is not easy for any team; learning a new system is no small feat at the best of times, let alone picking it up during the sporadic practices and morning skates of the NHL season. However, Tome Rowe has been the coach for three-and-a-half months now. A system of play, no matter how complex, should certainly have taken hold by now. Either it hasn’t taken hold, or it just doesn’t work. So if it wasn’t the system change; how about luck? To start with, losing two top-line players is rather unlucky on its own. In terms of team play, Florida has the sixth-worst PDO (98.40) in the NHL this season. The Panthers’ goaltending has been relatively good. Their shooting percentage on the other hand is a woeful 6.2 percent at even strength – only Colorado is worse. In contrast, the Panthers had the second-highest PDO (102.07) in 2015-16, buoyed by at 8.84 percent shooting percentage. That’s quite the difference, one which is reflected in the team’s scoring statistics. Jaromir Jagr (0.84 points per game last season, 0.55 this year), Jussi Jokinen (0.74 last season, 0.40 this year), Reilly Smith (0.61 last season, 0.46 this year) and Nick Bjugstad (0.51 last season, 0.23 this year) are all well off their respective paces from 2015-16. Are the hockey gods calling in their favours from last season? Do the Cats suffer from a lack of depth across their lineup? Is it possible the team everyone thought was on the rise is simply not as good as originally thought? Yes. Whatever it is, they’d better figure it out soon. Seven points back with 15 games remaining necessitates another stretch of dominant play in order for them to even sniff the playoffs. The Panthers are still fun to watch, but playtime is over.